See the Montserrat Volcano Observatory website for updates on the Soufriere Hills Volcano, and ssd.noaa.gov for volcanic ash advisories. - Oh, what a beautiful day! Here on Montserrat it is a glorious day. It is sunny and warm with just enough of a breeze to keep it from being hot. Absolutely beautiful. To bad we can not go to the beaches. There are still warnings on all the beaches. 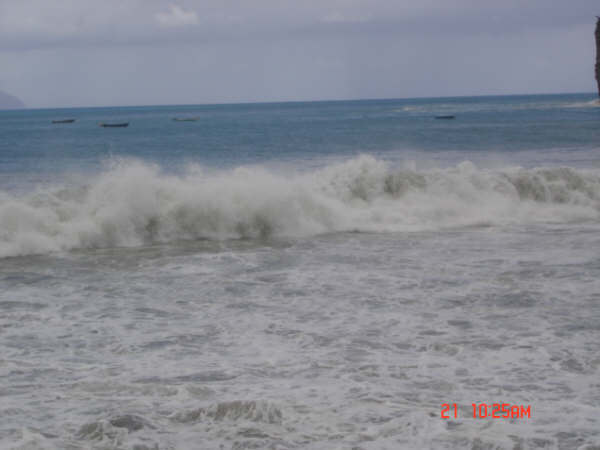 Wave action is still on the “really rough side. 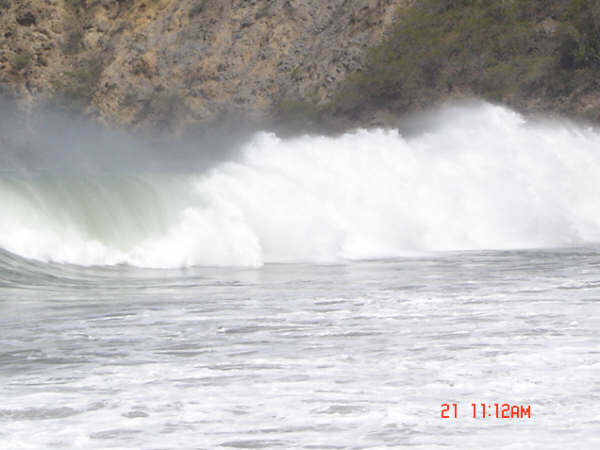 The waves today in Little Bay are 6 to 8ft with some up to 10ft. 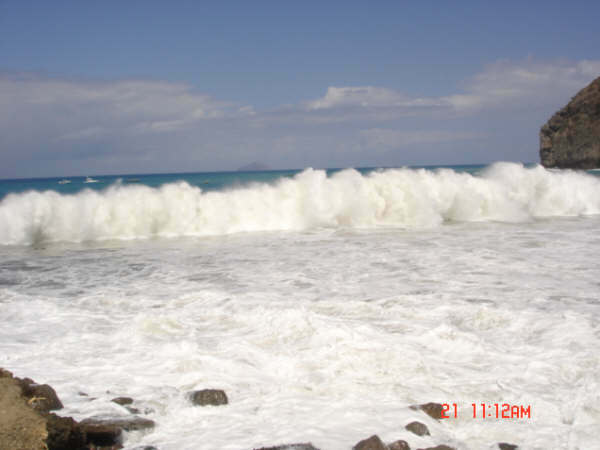 In Carr’s Bay the waves are averaging 8 to 10ft with some of the waves 10ft +. Isles Bay is at 6 to 8ft with some at 10ft. 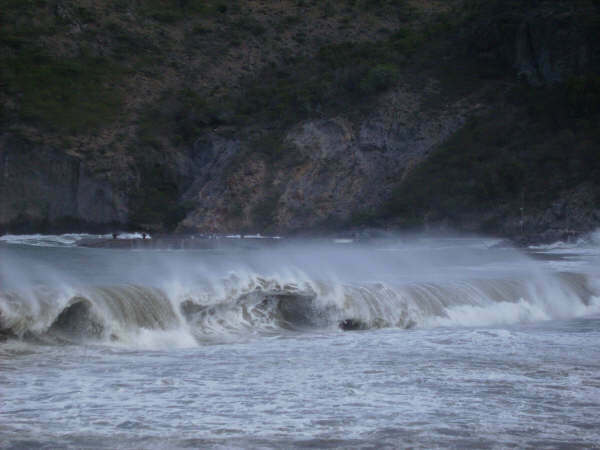 I was able to get a few pictures of yesterdays wave action in Little Bay, courtesy of Troy Dipperman of the Green Monkey Dive Shop (whose dive shop is now mere inches from the water instead of a few feet from the beach). 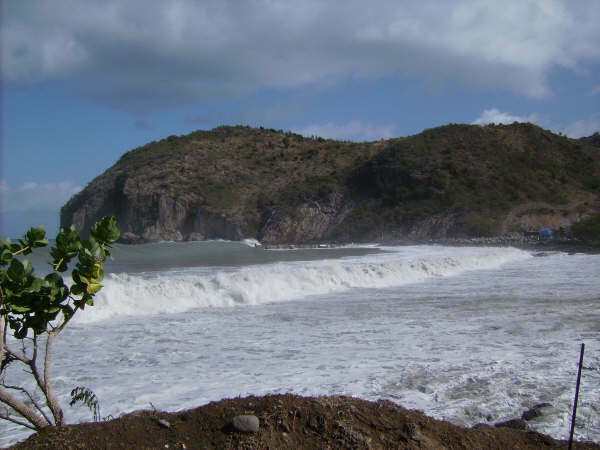 There was damage to the beaches & to the shower facility at Little Bay but there was no loss of life (thank the powers that be, in my case God). Unofficial word is 7 boats were lost, 8 counting the one still bobbing upside down in the bay. They were able to, some how, get the boats moved to a safer area. How? Depends on which hour of GRTT you listen to, and each hour the stories get better and better. For those who do not live on one of the Island, GRTT is the main news channel on the islands. GRTT stands for gossip, rumors and tall tales. Attached are the photos from yesterday and to day. How well do you know your celebrity gossip? Talk celebrity smackdowns here. 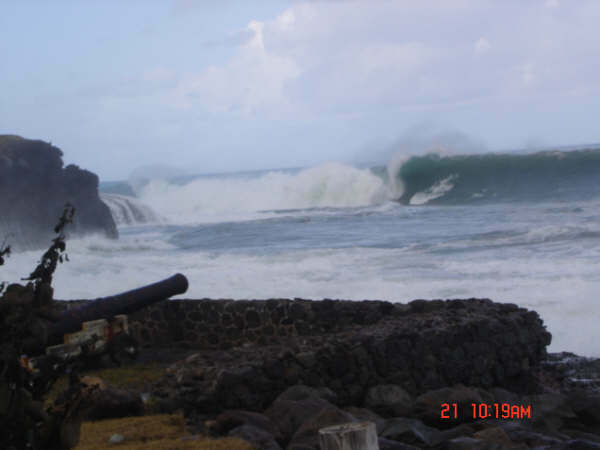 The big weather news is the swells coming in at Little Bay and Carr's Bay. 13ft + waves are being reported. The Old rusted out barge that was sitting in Little Bay is now off the reefs and on the rocks (some of it was deposited on the beach and on the road. A lot of debris has been deposited onto the beach and the road. Water has been coming over the road at Carr's Bay and the waves have been sending water into Festival Village. 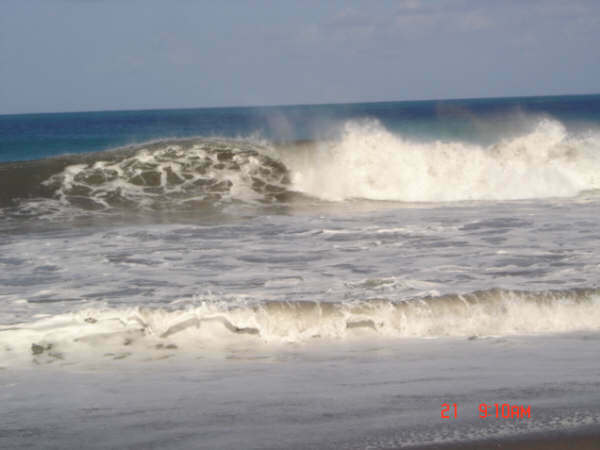 The swells are massive and extremely dangerous, please use your brain when around these areas or any of the beaches, it WOULD NOT BE COOL TO SEE IF YOU CAN BODY SURF AT THIS TIME, IN FACT IT IS NOT A GOOD IDEA TO GET IN THE WATER AT ALL. Sad news, quite a few of the fisherman lost there boats today..the boats were either smashed against the rocks or sank. Because of the waves, no one was able to get to there boats to move them. My heart goes out to the fisherman who own these boats, they have it rough enough without more worries added. Please keep these gentleman in your prayers, most were not insured. I was not able to get down to Little Bay today but I am planning to be there tomorrow morning to get pictures and will post some tomorrow. But good news is..the volcano is still quiet. Today it is overcast, cool and most likely showers off and on. What a storm we had last night! We had light rain off and on all day yesterday but about 8:00 pm we started getting steady rain with the light show and surround sound. And then the heavy rains came, all night it was kinda heavy, then sorta heavy and then really heavy downpours. If we did not get at least 5 to 6 inches of rain I will be very surprised. I live on the south side of the Bellham Valley (which is the wrong side to live on during downpours). The Bellham Valley runs along the Northwestern flanks of our active volcano so when there are heavy rains we get mudflows (mostly just muddy water flows). Well, last night we got Boulder Flows. The water was coming down the valley hard and fast, you could hear the boulders and rocks bouncing off each other. It was loud, it sounded like a 100 trains coming down. Makes it very hard to sleep, especially when you live close to the Bellham Valley floor. No worries, Anyone who lives near the Bellham are high enough up that we do not have to worry about damage to our properties nor our lives being at risk (unless you are stupid enough to try to cross the valley during one of its dangerous floods). The noise finally quit around 5 am but the water is still coming down. It is not a significant amount of water but if it starts to rain again it will be. The boulder flow washed out our road and at this point it will be hard to cross, but not impossible. We have to wait for the water to quit and Public Works will come and clear us a new road. It looks like it will be a couple of days before they can clear it for us. It is Friday and I doubt they will clear it on a weekend so we will have to wait until Monday. It is a good think we drove our car to the other side yesterday before the rains started, at least we will be able to get to town, we just have to walk across the valley. For the first time since March or April, we are getting "Montserrat Snow" (volcano ash). It looks like it is snowing but the stuff is brownish grey instead of white, but it covers everything,like snow, damages or kills plants, like snow,when it falls it looks like snow and when it gets wet you slip and slide on it, like snow. I have been running around all morning covering plants and getting things inside for protection. Yes, I slid and fell right on my tush, just like I did in the States when it snowed. The major difference between snow and ash, snow does not smell like sulfur, nor does it get all over everything in your house and make everything feel gritty. I do know there a lot more major differences but to me they are both a nuisance and I would rather not deal with either. Montserrat woke up to a nice steady rain shower this morning but most important, was the breeze that came with it. It felt wonderful. The past week it has been gorgeous but no breeze and humid so it was quite warm in the afternoons. The breeze today is a very welcomed change. The volcano has been doing some venting of gas, which is a good thing. The volcanic activity has been extremely low to non existent. 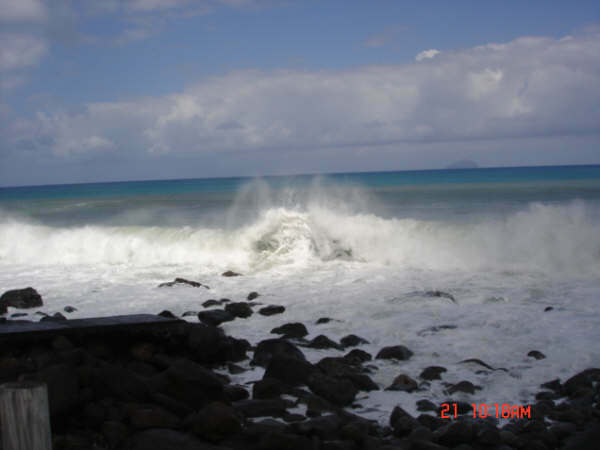 Everyone here on Montserrat are keeping our fingers crossed that it may be ending, we are hoping and prayer. Life with out ash, ahhhhhhhhhhhh, what a wonderful thought. Climb to the top of the charts! Play Star Shuffle: the word scramble challenge with star power. Play Now! Not much to say about the weather. No sun, no rain and no wind. Just a very overcast day in Montserrat. Though, it is nice because the temperatures are being kept down to a comfortable level. But it is hard to get anything done when the weather puts you in lazy mode. It has been a great day for curling up with a good book. The sky is overcast and it has been raining off and on all morning. My gardens love the rain (and needed it) and it has cooled off here (a great alternative to the heat we have had) but the guys doing my new concrete roof on the garage are not to thrilled with all the rain. I guess climbing up and down on the ladder every time it starts raining can become a pain after awhile plus they are tying the steel today so with the lightening I would be a little nervous too. I was hoping that the breeze would pick up but it never did. A few short burst of wind but nothing impressive. Please keep a watch on TS Karen, you don't want to be unprepared if she decides not to make that turn to the north. Have a great day and a better evening. Weather has been very hot, still, and steamy for the past few days. 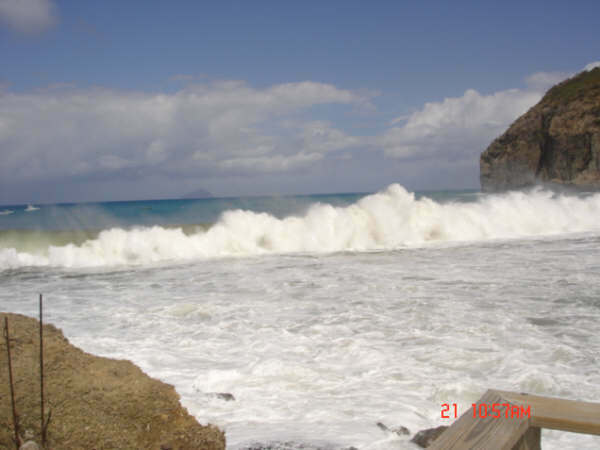 The sea is like glass and sulphur is in the air from Madame Soufriere. A friend who is currently staying near to VC Bird in Antigua reports that they’ve been smelling it over there too! Hopefully the trade winds will return soon and blow the fumes back out to the sea. Residents of Isles Bay were finally allowed to return a few days ago (evacuation orders from 9 months ago lifted). Heavy rains on Monday caused a mudflow in the Belham Valley, so hopefully all will remain safe! This will be my last posting for a while as I am just about to relocate back to the States as my work contract has ended. Will still be in the land of hurricanes, but hopefully won’t have to experience one anytime soon. Hopefully others in Montserrat will post some news for me to follow! Very sad to leave this magical place, but I know it’s not forever. It is a rainy day here in Montserrat. Grey clouds in abundance and rain. The thunder and lightening are scaring my poor dogs to death. From the looks of the "blob" sitting on top of us this will be an all day event. This means I will have 3 dogs in my lap or under foot until it quits. Thank goodness I have small dogs. Everyone be sure to watch 91L. To early to tell what it will do, so be prepared and stay safe. Can you find the hidden words? Take a break and play Seekadoo! Play now! The only blip on the radar for hundreds of miles in any direction is sitting on top of us now and causing a very heavy downpour that started just over half an hour ago. As I am typing this, a radio announcer, based in the north of the island, just said that “it looks like rain” so I’m surprised that with the severity of the downpour in Salem that it would appear that it’s dry just a few miles north! A little thunder too. Public Works has been taking down half a hillside recently for a road widening project and illegally (depending on who you believe) dumping the rocks and soil over the edge and into a streambed, which also happens to be a trail-head for one of Montserrat’s (formerly) lovely tourist attractions. I imagine that in this kind of rain, all that loose soil is now making its way down the hillside to blanket the reefs in the sea below. 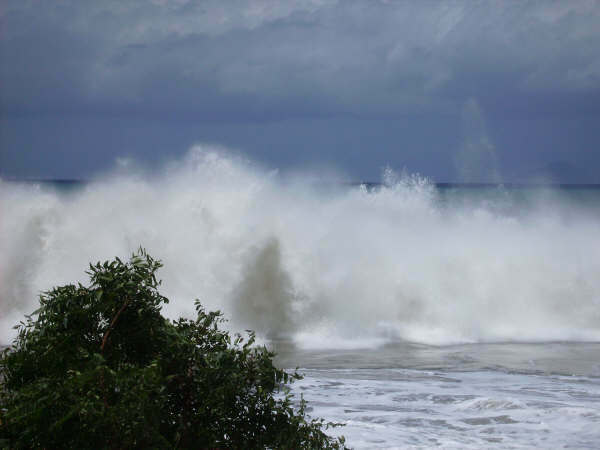 Concerned thoughts and well wishes are going out to those along the western Caribbean coast. It is such a beautiful day here in Montserrat. The sky is blue and the seas are calm. It is a little on the warm side with just enough of a breeze to stir the air. It is perfect day to be lazy and do nothing with out feeling guilty. Our thoughts and prayers go out to all in the path of Felix. Please be safe!!! Hooray that Dean is finally disappearing, it’s sad to hear of the losses in all of the affected places, and I hope the rainfall in the mountains doesn’t cause too much mud/flood damage. We had a few bursts of heavy rain, plus some thunder and lightning in the last few hours of the night. The rain has just now tapered off and all is still and quiet except for the pattering of drips from the eaves. A little red blip on the radar image explains the reason for this but it’s movin’ on out. Otherwise, the weather has been stunningly beautiful here for the past few days with the exception of some blue haze (volcanic gas emissions) in some areas due to southerly winds on Tuesday. Brings a bit of rotten egg smell to it, but it seems to be abating as the trade winds resume their mission. The volcano is quiet otherwise, and effective yesterday, another tranche of residents of Old Towne were allowed to move back into their homes after 6 months evacuation. The crazy thing is that the Vue Pointe Hotel is only being allowed to open but “without over-nighting guests” (i.e., bar/restaurant only). I’m not sure what kind of hotel that would be to not have anyone allowed to sleep there! Not expecting a grand opening anytime soon with that sort of restriction! Well, since about 2 minutes after I posted my last message it has been raining just about solidly – sometimes torrentially and otherwise just steady drizzle. Still windy with peaks and valleys of gusts. Someone asked me if hurricanes can impact volcanoes and the answer is yes – in laypersons language (I hope I’m getting this right) the heavy rainfall can cause mudflows (also known as lahars when taken in context of the volcano) which can destabilize the volcano and trigger further collapse of parts of the dome or slopes of the mountain. 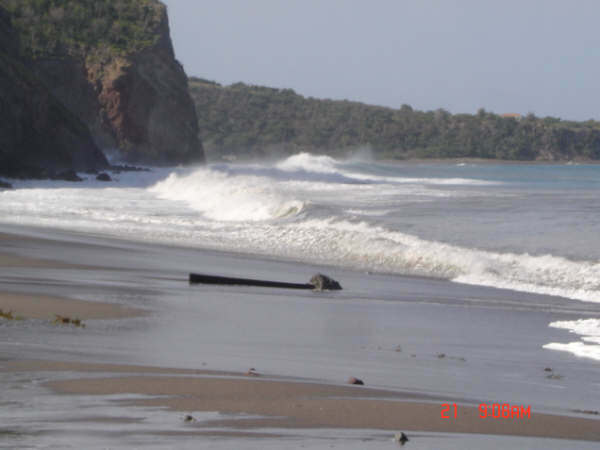 There can be more pyroclastic flows as a result of heavy rain – indeed, some of the dome collapses that the Montserrat volcano has experienced followed periods of rain. So far I haven’t heard of any major event at the volcano today – but it’s quite possible that there’s been some new activity. There’s a regular update made about midday at www.mvo.ms (click on Regular Updates). The volcano has, in general, been very quiet for the past 6+ months – and recently the Government rescinded part of the evacuation order that was made in February, which reopened parts of Old Towne to several dozen residents who had been “hoofing it” in the north all this time. I hope to make my first hike to see the “dry waterfall” – which hopefully won’t be dry – sometime this week. With all this rain, it’s likely to be slick and overgrown in there! The current went off at home shortly before 6am, right around the time that a feeder band brought horizontal rain and some wild wind for about 20 minutes – time to button up the windows. It has only sprinkled a little bit since then but it’s been very windy since the middle of the night. 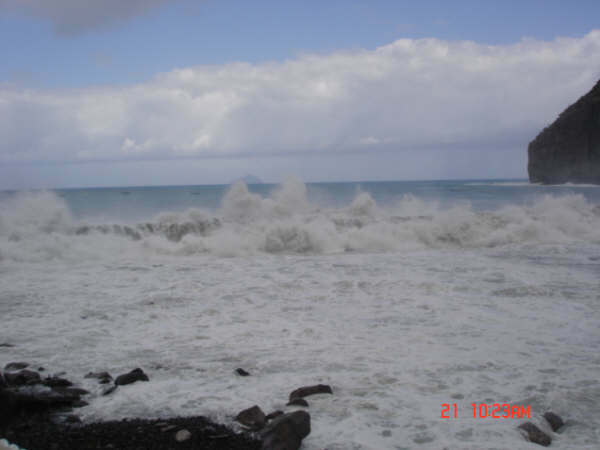 The airport is closed – it being one of the windiest locations in the inhabited portion of the island (the airport is occasionally closed due to strong winds on “regular” days). A lamp post in Lookout has blown over and knocked down part of the fence surrounding the tennis court up there, and there are quite a few garbage bins that have been blowing around the streets. But its business as usual and at least there’s electricity (and therefore internet) at work! Radio Montserrat has only been reading the NHC advisories, so it’s only through this site that I’ve heard anything from farther south this morning. It looks from the radar like we may get some more rain again soon. Hoping things farther south aren’t too bad, and that things much farther west won’t be too bad either. It’s been quite breezy here today, but nothing out of the ordinary – if anything, I’m glad to have breeze because it tells me we’re not in the direct line of fire where a hot and heavy stillness pervades a place the day before a storm like this. Quite hazy skies and a few sprinkles this morning, but it’s bright and sunny now. 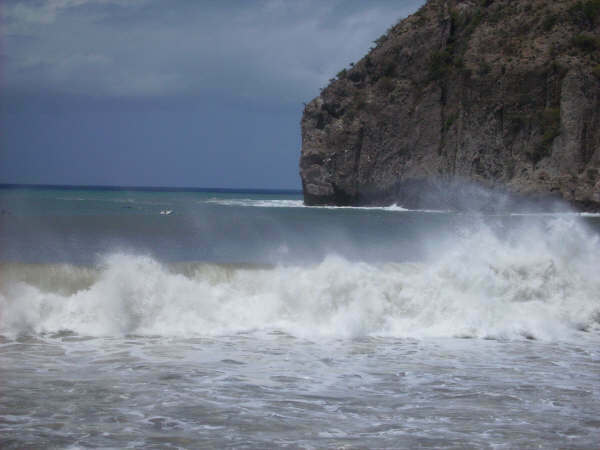 Things aren’t looking too bad for Montserrat though looking at the size of Dean we do expect to get some rain and a bit more wind than usual from the outer bands tomorrow. Enough to wreak havoc with weekend travel plans for several folks I know…but better to stay put than get half way somewhere and be stranded somewhere abysmal like VC Bird Airport. Here’s hoping that folks in Martinique and Dominica (and particularly the lovely village of Grand Bay) are ready and braced, we are thinking of you! Thanks to Barb in Brevard and others up north for sending wishes and prayers – I’m now sending them down the islands. Not looking so good right now, hoping that Dean will steer like a dog’s back leg (that’s what my dad used to tell me I was doing when I was daydreaming at the helm). Went to bed last night to the sound of rain, woke up to the sound of rain. I love it, perfect Sunday weather. I wonder if it dampened the Miss Caricom International pageant that was held here last night at our beautiful new cultural centre in Little Bay. Imagery suggests that it might stay a bit damp today, which is just fine with me, the farmers, and the forest. Well the rainy season started a few weeks ago – here and there – but we finally got our deluge today, maybe second one this year. It’s still going on..and off…and then on again. After a totally gray day all day, the noise and lights started after lunch…then turned into rain just after the thunder/lightning had knocked off the power at work around 3pm…..and then I was stranded in Rams by downpour (realising that being stranded in Rams is about the last place in MNI I’d rather be). I threw caution to the wind to get out to my vehicle (I was doused but as yet show no sign of sickness or death as predicted by the onlookers in the doorway of Rams J) and went home quietly and slowly with 4WD engaged. Current off for a few hours, but nothing compared to the recent power outages of a few weeks ago due to the bum generators. The noise and light have somewhat simmered down but we’ve probably had a couple of inches of rain, esp. towards the south. Definitely a tea and more tea kind of evening…. Sorry for the slow start here, I guess things are just on the quiet for now...no complaints except that it's been a little dry...at least until Sunday when much of the island experienced some torrential downpours during the early hours and then again mid-afternoon. The volcano has been napping for the past couple of months...but heavy rain can cause mudflows which destabilise things around the volcano. Hopefully tropical weather won't impact the volcano too badly this season....although some people actually wish that it would and that the dome would just get on with collapsing but without causing any damage, and then people could get back to their normal routines. There are about 100 persons who were evacuated from homes in the Old Towne and lower Belham area since around February...and they are appreciably anxious to get back home. Anyway, after a very quiet few weeks, here is the volcano report from June 11th, taken from www.mvo.ms. "Measurable activity remained low until the onset of the heavy rainfall associated a storm early this morning. Lahar (mudflow) activity was detected in all drainages around the volcano between 01:30 and 04:00, and subsequently two larger (relative to recent events) pyroclastic flows occurred. Activity had returned to previous low levels at the time of reporting, although low-level rockfall and pyroclastic activity is ongoing. Whilst lava extrusion has ceased and the dome may not be actively growing, it remains as a large mass of partially molten lava capable of collapsing or exploding. The amount of material above Tyres Ghaut to the NW is sufficient to generate pyroclastic flows and surges capable of impacting on the lower Belham Valley and lower lying areas up to lower Happy Hill and the Old Towne ridge."